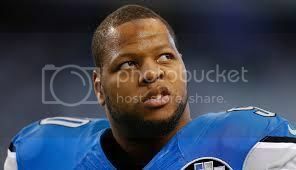 Defensive tackle Ndamukong Suh signed a huge contract with Miami for what amounts to nearly $20 million per year. He's guaranteed at $55 million over the first three years of the deal. The overall size and guarantees set a new market for defensive tackles. Suh is certainly an impact player and routinely notches in the top 5 defensive linemen in advanced stats like +EPA and +WPA, but is he worth the price? I'll use two measures to evaluate the deal. First, I'll look at career Approximate Value (AV), a metric created and provided by Pro-Football-Reference.com, and how the market values AV at the defensive tackle position. Then I'll look at how the market values +Expected Points Added. We'll see where Suh's typical production and his new contract terms fit in the market. AV is a player valuation metric that apportions team success among players. Each position has a different formula, but the intent is consistent: better players earn higher numbers. As creator Doug Drinen put it, "...while stats will figure into it to some extent, a defensive player's rating will be largely based on how many games he played, how many games he started, how good his team was defensively, and whether he garnered any all-pro or pro bowl honors." I merged AV data from PFR with salary data from Over the Cap and Spotrac for the years 2006-2014. I only looked at players in their 6th year of service or later to capture only salaries for free agent-eligible players. Although most 5th-year players can be free agents, the two CBAs over the period made it too difficult to parse them apart. I used cap hit as the measure of player cost. Although cap hit can be an imperfect measure of a player's yearly cost to a team, it is probably the best among the alternatives, especially in aggregate. Cap hit captures what is most precious to a team, its cap allowance, and it reflects only salary that is realized rather than the largely fictional numbers in press releases. I adjusted all salary values by the league cap for each year. All salaries in this post are in "2015 cap dollars." AV is remarkably linear with respect to cap hit. The DT position is not unique in this regard, and the chart below shows just how linear the relationship is. Teams pay about $500,000 per marginal point of AV. Suh's previous AV scores are displayed at his anticipated cap hit number to give you an idea of where his new contract fits in the market. By this measure, it appears that Suh is being paid just about market price for a player who can be expected to produce around 13 AV. I like AV a lot, and I rely on it for a number of things. And apparently GMs are influenced by the same things that AV is based on, if the linear relationship is any indication. But AV is subject to biases and other problems and wasn't intended for this kind of analysis. For instance, it relies heavily on All-Pro honors and Pro Bowl selections, especially at the top end of the range of players. There might also be some confusion in terms of the direction of causation--that is, some players might get starts simply because they are getting paid so much. So I also looked at player +EPA which, despite its own biases and other problems, directly measures a player's play-level impact in terms of his effect on the game's net score. The relationship isn't as linear. As you might expect, there are diminishing returns for highly paid players. I won't post the charts for other defensive positions, but trust that they are all shaped with the same distinctive logarithmic curve. 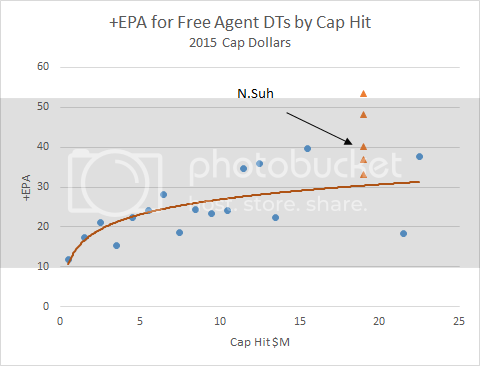 Suh's +EPA from his first five seasons are also added at his anticipated cap charge for reference. 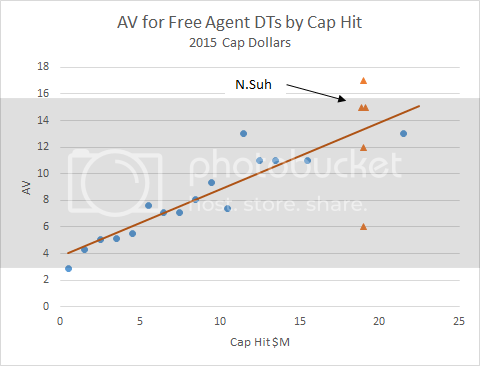 From this perspective, Suh appears to be a bargain even at nearly $20M per season. To be honest, I was expecting to find exactly the opposite result, but there are some other considerations. We can't assume Suh will continue to have the same impact he's had over the past few seasons. It's a good bet based on his consistency, but far from certain. It would be very hard for him to perform any better than he has. There's just not a lot of space left up there in the stratosphere. There's a chance of injury (or suspension), and there is no guarantee his fit into Miami's defense will be as seamless as it was in Detroit. We can expect some regression on net, but keep in mind Suh will regress to his own mean, not the league mean. And although the downward curving performance-salary curve is fairly clear, there is large uncertainties in the upper range of players. There simply aren't very many of them, so sample sizes are low. One additional consideration is the gladiator-bricklayer concept. I'm tempted to say that a GM could optimize the expected production of his defensive roster by targeting FAs in the $5-10M range. For example, is it better to have one Ndamukong Suh contributing 37 +EPA/yr and one replacement level player contributing 5 +EPA/yr next to him? Or is it better to have two $10M FAs and a $5M FA, each producing around +25 EPA/yr? Mathematically, the latter seems to be the better scenario, but that's only true in the bricklayer model. A gladiator model suggests that you can only have 11 players on the field at once, so it's good to confine as much production in one player. You could think of the concept as production density. The reality is probably somewhere between the gladiator and bricklayer models. For non-quarterback positions, my sense is that reality is closer to the bricklayer model given the flatness of the production-cost curve. Ultimately, I'd say that Suh's contract is consistent with the market, but the market might not be consistent with what's optimum.